In Japan, GDP growth is forecast to stay flat at 0.5% this year and in 2017. Growth will be sustained by lower energy prices and fiscal stimulus but the outlook has certainly become more challenging. The structural reform policy to revive the Japanese economy continues to disappoint. Inflation has been fluctuating between zero and 0.3% since last summer, and domestic demand remains mediocre. In light of these economic conditions, Japanese businesses appear to be confronted with a number of challenges, that do not seem to adversely affect their trade receivables management. A topic Japanese suppliers appear to have a strong focus on. The protection of their businesses against the risk of payment default arising from B2B trade on credit appears to be of paramount importance for Japanese suppliers, who appear to be the most likely in Asia Pacific to trade on credit in their home market. Suppliers surveyed in Japan are highly likely to offer credit terms to their B2B customers. On average, 52% (down from 57% last year) of their total B2B sales value was made on credit. This percentage, which is above the 46% average for Asia Pacific, is almost equal to that observed in Singapore, which appears to be the most trade credit friendly country in Asia Pacific. Over the past year, Japan has seen a 2.4% drop in the proportion of domestic B2B sales made on credit. Additionally, the proportion of foreign credit based sales dropped by 6.4%. This is likely to reflect weaker demand from China (Japan’s main trading partner), difficult business conditions in other major export destinations for Japan (such as the Eurozone and other Asian markets), the appreciation of the Japanese currency, and sluggish private consumption. 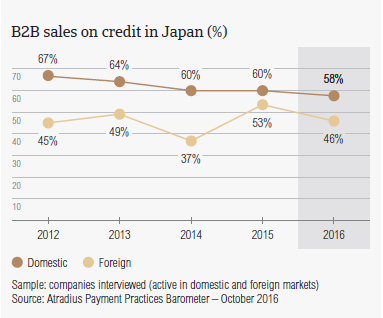 Domestic B2B customers in Japan appear to be notably more likely to be offered credit terms than foreign customers. On average, 57.7% (60.4% last year) of the domestic and 46.3% (52.7% one year ago) of the value of foreign B2B sales of the suppliers surveyed in Japan was transacted on credit (averages for Asia Pacific: 50.3% domestic and 42% foreign). Besides being consistent with the regional pattern, pointing to a stronger preference of Asian companies to trade on credit domestically than abroad, this relatively lower proportion of foreign sales transacted on credit terms may reflect the earlier mentioned drop in Japanese exports. 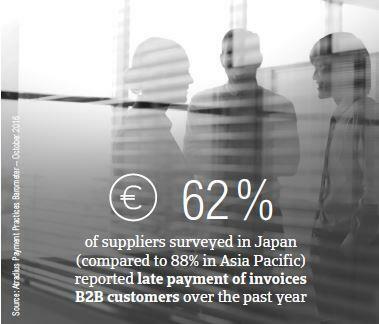 Notably fewer suppliers surveyed in Japan (62%, down from 66% last year) than in Asia Pacific (88%) reported having experienced late payment of invoices by domestic and foreign B2B customers over the past year. This is the lowest percentage of suppliers surveyed in Asia Pacific reporting this. More specifically, an average of 25% of the total value of B2B receivables remained unpaid past the due date. This is far below the average for Asia Pacific (44%), and is the lowest payment default rate observed in the region. On average, 25% of the total value of domestic and foreign B2B invoices in Japan was reported to be overdue. Both percentages for the country are far lower than the average for Asia Pacific (44%), indicating that Japanese businesses are less impacted by late payment from B2B customers than their peers in the region. This despite being the country in Asia Pacific most inclined to offer credit terms to domestic B2B customers. Over the past year, the domestic overdue rate in Japan remained stable. However, the foreign overdue rate fell by an average of 4%, which may reflect the previously mentioned drop in export trade. Late payment of (domestic and foreign) B2B invoices in Japan is reflected in the Days Sales Outstanding (DSO) figure resulting from responses given by the suppliers surveyed in the country. Despite the slight variation in the foreign overdue rate, the DSO figure in Japan has remained steady over the past year. It averages 41 days and is in line with the regional average. 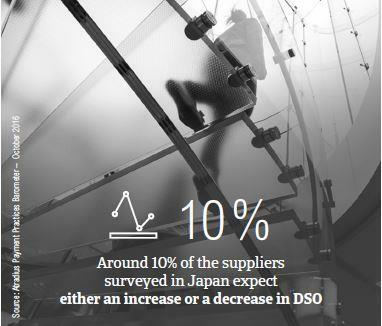 A staggering percentage of suppliers surveyed in Japan (85%) expect no change in their DSO over the next 12 months. Around 10% of the suppliers surveyed in the country expect either an increase or a decrease in DSO. This finding tallies with the 3.3% of Japanese suppliers (compared to 7% in Asia Pacific) considering the collection of outstanding invoices, also in emerging markets, as the greatest challenge to business profitability this year. The comparison of these response rates would suggest that Japanese suppliers are far more efficient in collecting overdue receivables than their peers in Asia Pacific. The majority of the suppliers surveyed in Japan (nearly 34%, compared to 20% in Asia Pacific ) consider cost containment to be the greatest challenge to business profitability this year. This percentage, which is the highest in Asia Pacific, may reflect Japanese suppliers’ concern about the containment of costs associated with the adverse impact of weaker demand from China and the significant drop in exports. This assumption is corroborated by nearly 20% of Japanese suppliers (14% in Asia Pacific), who consider a likely fall in demand of their products and services to be the biggest challenge to business profitability they will be confronted with this year. This opinion may reflect Japanese trading companies’ concerns about further appreciation of the Japanese yen, and its potential suppression of the country’s exports. 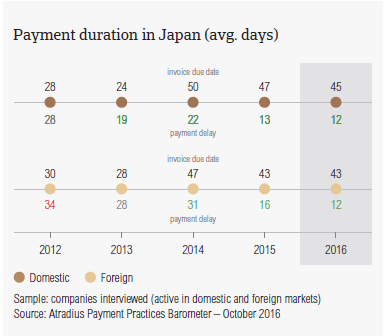 Japanese suppliers request payment of invoices by domestic B2B customers, on average, within 45 days of the invoice date (average for Asia Pacific: 32 days). Foreign customers are requested to settle invoices almost in the same time frame (averaging 43 days from invoicing, compared to an average of 33 days in Asia Pacific). These are the longest payment terms offered to B2B customers in Asia Pacific. Over the past year, both domestic and foreign payment terms offered by Japanese suppliers have not changed significantly. B2B customers of Japanese suppliers make past due payments within the same time frame as they did one year ago (on average, two weeks after the invoice due date). This timing has not changed over the past year, suggesting that the Japanese suppliers interviewed turn overdue invoices into cash, on average, around two months from invoicing. This is in line with the average for Asia Pacific. 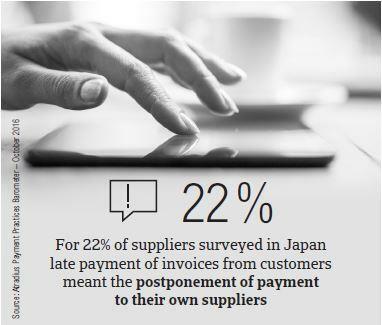 In line with the opinion expressed by the majority of suppliers surveyed in Asia Pacific, most of those surveyed in Japan (30%, up from 21% last year) believe that their domestic B2B customers pay invoices late due to liquidity issues. This response rate, which is the lowest in Asia Pacific, is also well below the 46% average recorded at regional level. This would suggest that Japanese businesses experience less pressure on their liquidity position than that experienced by businesses in other countries in Asia Pacific. Consistent with the survey pattern, most of the suppliers surveyed in Japan (33%, up from 20% last year and in line with the regional average) reported that foreign late payment is most often due to the complexity of the payment procedure. 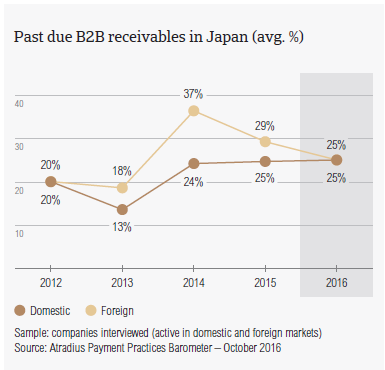 31% of Japanese suppliers (down from 37% last year) said that foreign B2B customers pay invoices late most often due to lack of liquidity. Significantly more suppliers in Japan (45%) than in Asia Pacific (25%) reported that late payment did not have a significant impact on their business. This likely reflects a strong focus of Japanese companies on the protection of their businesses from the risk of payment default arising from B2B trade on credit. This finding tallies with that highlighting that most of the suppliers surveyed in Japan (around 65%, compared to 44% at regional level) will not change their mix of credit management tools over the next 12 months. For 22% of suppliers surveyed in the country (33% at regional level) late payment of invoices from customers meant the postponement of payment to their own suppliers. The standout finding here is that, as a consequence of late payment, only 10% of the suppliers surveyed in Japan (compared to 25% at regional level) had to either delay investment in the business or restrict R&D. This suggests that late payment did not affect investment in business growth in Japan as strongly as it did across most of the Asia Pacific region. 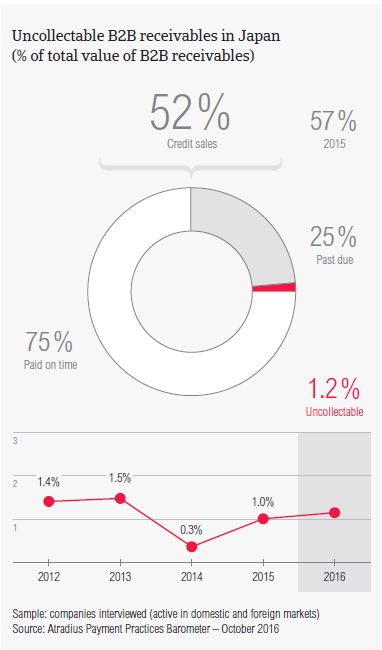 Suppliers in Japan reported having written off 1.2% of the total value of B2B receivables as uncollectable. This is below the average for Asia Pacific (2.1%). Domestic uncollectable receivables were written off less often than foreign ones. Over the past year, the percentage of write-offs in Japan remained stable. This suggests unchanged efficiency in collection of overdue receivables. Uncollectable domestic B2B receivables in Japan originated most often from the business services industry. Nearly 40% of the suppliers surveyed in Japan (compared to 51% at regional level) reported that they had to write off receivables as uncollectable most often because the customer went bankrupt or out of business. As many respondents in Japan as in Asia Pacific (35%) said that they wrote off receivables as uncollectable because the debt was too old to be collected. Suppliers surveyed in Japan reported trading on credit terms mainly with B2B customers in the construction, consumer durables, food, electronics and business services industries. Invoice payment terms extended to B2B customers across these industries do not appear to substantially differentiate from the country average (40 days from the invoice date). The least lenient terms for payment of invoices are granted to B2B customers in the food industry (averaging 25 days from the invoice date). B2B customers in the construction industry take the longest to pay overdue receivables (on average, 20 days after the invoice due date, compared to a 12 days average for the country). The construction and the metals industries generated the largest proportion of past due B2B invoices, with nearly 45% of the total value of B2B invoices’ paid late. Based on survey responses, late payment of invoices due to customers’ liquidity constraints occurred most often in the machines industry (57% of suppliers surveyed in the country cited this). Most of the suppliers surveyed in Japan (75%) are of the opinion that the payment practices of their B2B customers in the industries they mainly trade with (see above) will not change over the next 12 months. This with the exception of the food industry, where 25% of the Japanese suppliers expect a slight deterioration in the payment behaviour of their B2B customers over the same time frame. Another exception is the machines industry, in which 23% of the surveyed suppliers expect the payment behaviour of B2B customers to worsen. In 2016, growth in the Japanese ICT sector is expected to be modest at 0.9%, due to market saturation and a low economic growth forecast of 0.6%.